Maria Kirilenko is a huge tennis star from Russia who has a ton of fans. Maria is currently not playing on the WTA circuit in 2017 as she just had a baby but she may return soon. For her many fans here are some great photos of beautiful Maria Kirilenko in 2017. 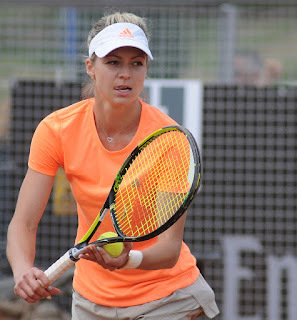 Maria Kirilenko was born on January 25, 1987, in Moscow, Russia. Maria has long been considered the most beautiful woman in tennis. After a brilliant junior career in which she won the 2002 U.S. Open Girls Singles title, Maria Kirilenko started playing on the WTA women's tennis circuit. So far in her career, Maria Kirilenko has won 6 WTA singles titles and 12 WTA doubles titles. Her career earnings are $7 million. Women tennis players can earn very good livings these days. At the Grand Slam tennis tournaments, the farthest Maria Kirilenko has gone is the quarterfinals at the Australian Open, French Open and Wimbledon in singles play and the finals at the Australian Open and French Open in doubles play. Maria Kirilenko won a Bronze medal at the 2012 London Olympics in doubles play. Hope you like the photos and hope to see beautiful Maria Kirilenko back on the tennis courts soon. Check out more beautiful women tennis players photos below.